Looks like sea glass.... but it's not clear...? I picked this piece up because I thought it was black seaglass, but when I got home, I realized it's not. It is frosted outside and has chips which appear to to reveal glass but you can't see through it. Any idea what it is? THANK YOU! Comments for Looks like sea glass.... but it's not clear...? The best way to guess an April value on sea glass are 1. The intensity of fogginess (the less foggy ones aren’t of value Bc it’s the age of the wear of the waves and sand over time that creates the fog) 2. The color and 3. the edges which should always be rounded. I wouldn’t scratch the glass just wet it and then hold it to the light. What they call black glass is most valuable however it’s not actually black but rather a deep olive green with brownish specks in it. That’s the good stuff! You have indeed found sea glass. Don't be put off by its opacity as many types of glass have reason to be thicker than others. I find a great deal of this type of glass very near to me at Redcar, it's everywhere. It's mottled black in appearance, but if you look closer & put a light directly behind it it actually comes up as deep green. It's a very thick glass depending on what part of the bottle you find (some of my pieces are over an inch thick at the base). I believe the glass to be so thick for one of 2 reasons. The 1st is that the glassmaking process at the time of the bottle's creation was very crude & the glass became contaminated with all manner of other elements, OR 2, the bottles made from this glass were designed for distribution worldwide by ocean voyage, which would likely mean a great deal of jostling & bumping around, hence the glass was made thicker. I dipped it in water and held it at a bunch of different angles in the sun, and tah-dah, I hit the right light, and could see through it! 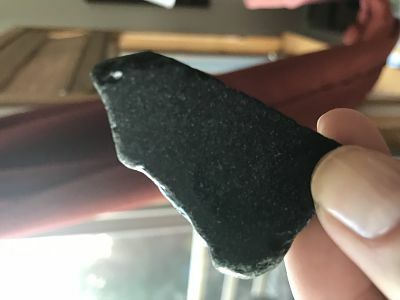 I have some black seaglass, but usually it's much easier to identify. Does this mean I have a super rare piece of black glass that is worth millions?! Haha, I wish! Looks like sea glass because it actually is sea glass. Put it in water and hold to light. It does look like seaglass, especially because of the shape and frost. 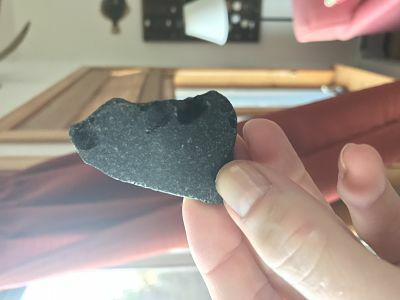 I have found some black seaglass which was originally a very dark yellowish green glass and very difficult to see through. Be sure to use a very bright light and place the light on the chipped areas and edges which would maybe be a little thinner so some color may come through.